I have had chronic dandruff for years. And I wouldn't lie that I was scared to get rid of it by using commercial anti dandruff shampoos. The amount of hair fall commercial shampoos give post using on scalp did scare me. 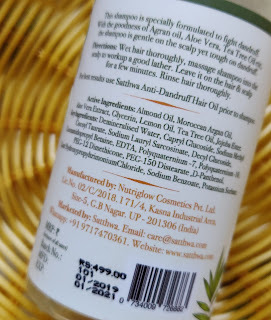 After having a good experience with Satthwa Moroccan Argan Shampoo Oil I didn't even think for a second before ordering third Anti Dandruff shampoo. After using it for around 1 month (2 washes per week) here is my review. Let me first let you know that my hair is dry, frizzy, thick with oily scalp. I wash my hair twice a week without oiling my hair. If I apply any oil to the scalp it becomes excessively oily and requires lot of shampoo to wash off the oi. So I don't oil my hair before a wash. The product is packed in a plastic see through bottle. When I received my order today from Amazon, the pump was separate and we needed to remove the cap and assemble the pump on bottle. Overall it's a good packaging wherein we can see the quantity of the shampoo. The shampoo has a citrus fragrance and is very runny in consistency. The texture is gooey with opaque colour. While using for the first time, I diluted the shampoo in water and it just cleaned the scalp to some extent and I could notice reduced flaky scalp. Second time as usual I used diluting the shampoo so the effects weren't much visible but I could notice slightly reduced dandruff. Third wash I decided to directly use the shampoo on my scalp and see the effects. The shampoo reduces the dandruff effectively and slowly. I noticed that the dandruff on the back side of my head was totally gone but crown part of my head still had some dandruff. Again for another hair wash cycle I used the shampoo on my crown area and it totally reduced the dandruff and I couldn't help but praise the brand to come up with such an effective product. Every time I washed my hair, I used the shampoo twice on my hair and I shampooed my scalp and not hair. Although the product reduces dandruff effectively, it leaves the hair rather in weird condition. I could notice how my hair is neither clean nor dirty. I mean am unable to understand the condition of my hair. Also when I massage the shampoo on the scalp a good amount of hair fall is experienced. I find this pretty normal thing, whenever I used to oil my hair, I experienced the same thing. Plus many commercial shampoos bring in a lot of hairfall. So compared to the hair fall which commercial anti Dandruff shampoos cause, Satthwa Anti Dandruff shampoo doesn't cause much hairfall. Also once I have a gap of 5 days or more in between two washes, my scalp becomes oily and I can notice some dandruff already. So keeping the dandruff in check is basically what Satthwa Anti Dandruff shampoo does. Also the brand claims to that the product is tough on dandruff and gentle on scalp which is very true in my case. Overall am happy that my hair is dandruff free and am on my way to get rid of it by using this shampoo continuously. If I don't wash hair for many days the dandruff and itchiness returns to some extent which am ok as my dandruff was very chronic. 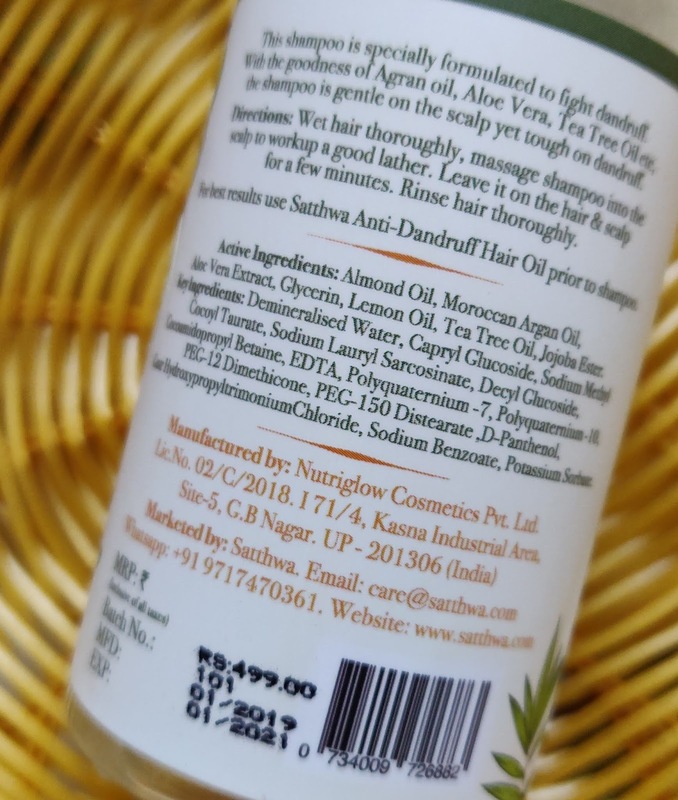 If you are looking for an effective, safe yet affordable anti dandruff shampoo, then give Satthwa Anti Dandruff shampoo a try. 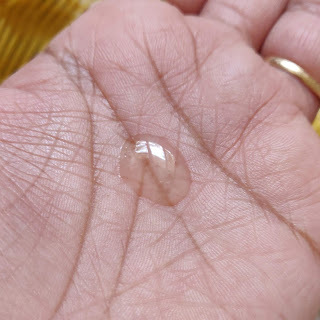 It will reduce the dandruff gradually without causing much hairfall. 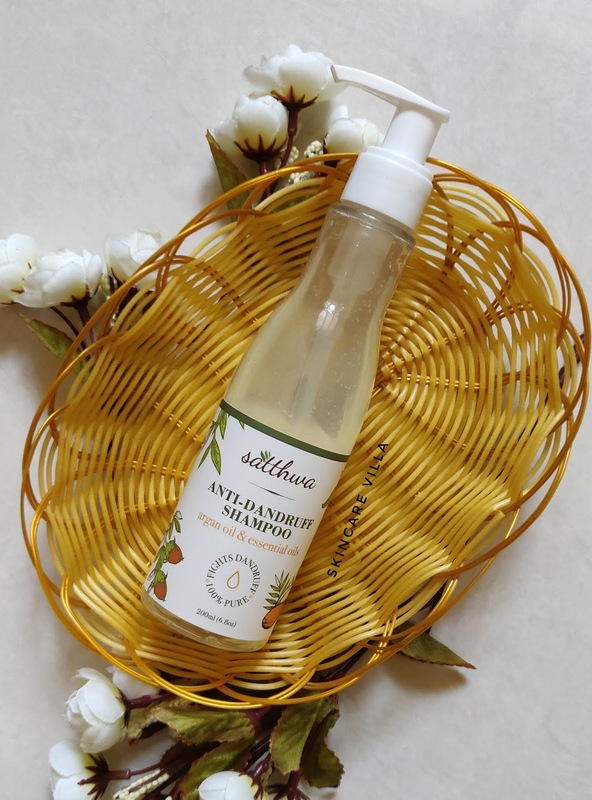 Moreover the formula is paraben, sulphate free, so if you are into sulphate free shampoos they this is a must try for anti dandruff.